Today, while my boyfriend languished on the sofa fully primed for a whole day of sport, I was off out on my own exploring in the romantic yellowy-orange-falling-leafy-gorgeousness that so characterises these lovely autumnal days of late. I’ve lived in and around South East London most of my life yet it was only today I realised (when I noticed the brown sign, of course) that I hadn’t been to the Dulwich Picture Gallery since I was a child. As is so often the way in life though its often the things that are right under your nose which you pay the least attention to. I changed all that today though by bumbling into the immaculate entrance hall of the gallery while attempting to stamp dirt off my boots after my rather muddy walk in Dulwich Park (slick, I know). I explained my project to the staff in the wide open ticket hall which was very quiet and full of people and thus as hideously embarrassing for me as ever. They all looked appropriately bemused by me but obliged my multitude of questions, said I was free to write about them on the blog and that I could take as many photos as I liked of the gallery. I was a happy lady and immediately assumed the inconspicuous character of a quiet arty type slinking around enjoying the art, trying not to feel very out of place and under-dressed among the huge gilt gold framed masterpieces and people walking around in tweeds. Dulwich Picture Gallery opened in 1817 and is the oldest public art gallery in England. 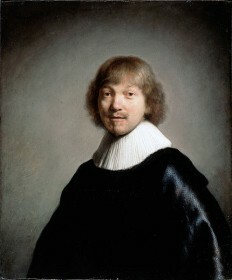 The vast majority of the art works here started life as a collection sourced for the King of Poland by two London art dealers, Mr Bourgeois and Mr Desenfans. The dealers travelled all over Europe buying fine art that reflected the “in” tastes of the day and one that would befit a national gallery, they included famous Italian and Dutch artists and paintings depicting Greek mythology (education in the classics through the medium fleshy nudes was very “in” and the best type of education in my opinion). Sadly though the collection never quite made it over to Poland as the king suddenly abdicated after a dismal attempt at unifying Poland with his good hearted but ill conceived commonwealth policies. The two art dealers were left with this rather burgeoning collection of masterpieces which they piled high at Mr Desenfans’ house where they stayed until he died. In memory of Desenfans his business partner Bourgeois commissioned a mausoleum-come-art-gallery to be designed by Sir John Soane (architect of the Bank of England among other notable London buildings), where the poor forgotten collection could finally be displayed. 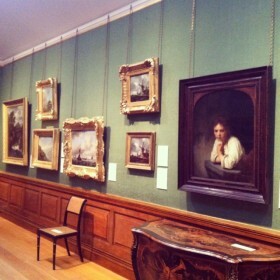 The gallery was soon on the map with the art enjoying classes and London artists of the day came to copy famous painters like Rembrandt, Rubens and Van Dyck, some of the artists became famous and included Constable, Turner and even Van Gogh. 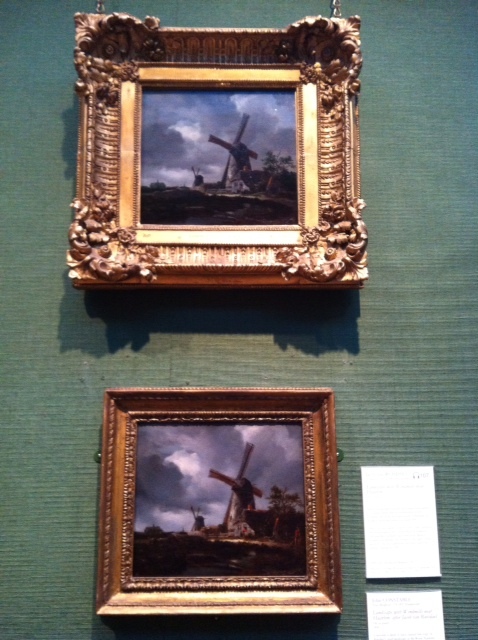 Interestingly some of the originals are displayed together with their later copies, this one was copied by Constable as a student (loving the subject matter too of course, who doesn’t love a windmill?). I think this just shows how important it is for art to be out in the public domain, where people can mooch around and take it in, study it, copy it and use it to inspire their own work. Every interpretation of a painting is different, how we see art and how we enjoy it is totally different and unique, but this for me is the great joy of an art exhibition. 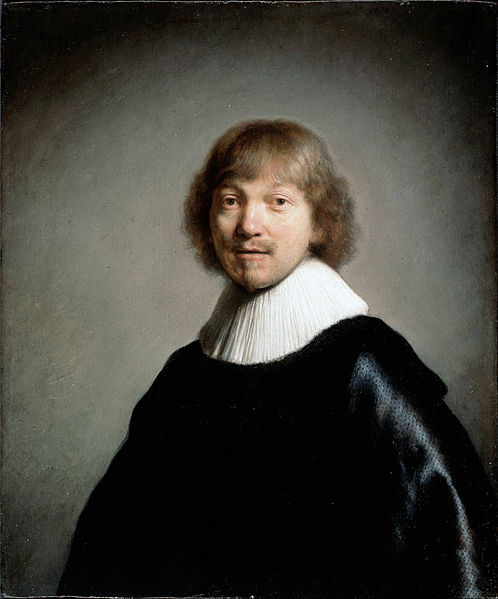 Interestingly the painting listed in the Guiness Book of Records for being the most frequently stolen piece of art hangs in Dulwich Picture Gallery, it is Rembrandt’s Jacob de Gheyn III and has been stolen and recovered no less that 4 times. The places of recovery have been from the back of a taxi, a left luggage office in West Germany, the back of a bicycle and under a bench in a Streatham Graveyard. In 1983 a Thomas Crown Affair style burglar made an entrance by smashing a skylight and shimmying down a rope, quickly crow-barring the painting off the wall then shimmying back up the rope to make his escape, all in the space of 3 minutes when the police arrived too late to catch the thief. Unbelievably the painting has always been recovered and remained unharmed after all its excursions from the gallery and it is now on display with a rather heightened level of security around it. As always my visit to this brown signed destination was a great one. I’m never really sure whether every one I visit will capture my attention and be enough to inspire me to write a blog about them, but blow me down they always creep up and bloody surprise me with their greatness. Dulwich Picture gallery has an amazing permanent collection and world class quarterly temporary exhibitions, but it also has a fantastic array of educational workshops and events going on too. Their education department is multi-award winning for the variety and diversity of imaginative courses they run for all ages. They do this outside the confines of the gallery and out in the community where everyone can access it. My visit here was fabulous and the engaging educational elements only made me even more determined to get go that extra mile on my own Arts and Community Initiative 🙂 I loved it there, and so will you.